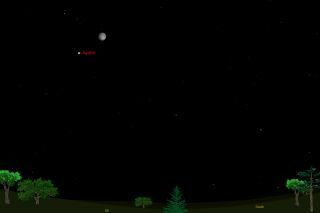 This sky map shows how Jupiter and the moon will appear in the night sky at 8 p.m. local time to observers in midnorthern latitudes on Nov. 8, 2011. As the moon approaches its full phase this week it will glide past a brilliant, silvery "star" shining with a steady glow. In reality, that star is the king of the planets — Jupiter — which will appear close by the moon tonight (Nov. 8) and Wednesday. Early-bird voters who turned out for Election Day in the U.S. today may have already seen the moon hovering about 10 degrees above and to the right of Jupiter. Remember that your clenched fist held at arm’s length covers roughly 10 degrees of the sky. So tonight, the moon and Jupiter will be separated by "one fist." On Wednesday night (Nov. 9), the moon will have shifted over to Jupiter's left, and the separation between the two will be about half of what it was on Tuesday. The sky map of Jupiter and the moon here shows their positions on Nov. 8. Later in the week, after the moon has moved away to the east, Jupiter will continue to rule the night. At dusk it's already ascending in the east. Binoculars or a small telescope reveal Jupiter's four Galilean satellites, engaged in their never-ending dance around the giant planet. On Tuesday, three of the satellites (Ganymede, Callisto and Europa) will be on one side of the planet, while Io will be the sole satellite on the other side. On Wednesday all four will be visible on one side of Jupiter and they will be paired off with each other. Io and Europa will appear closest to Jupiter, while Callisto and Ganymede will appear farther out. But don't let the moons seduce you away from the body of Jupiter itself, especially around now when it appears near its largest. Jupiter is now larger and brighter than at any other time between 1999 and 2023. Long before Jupiter reaches its highest point in the sky it's quite high enough to show a steady image on favorable nights — and what an image it is! In a 6- to- 10-inch telescope Jupiter is lavish with cloud detail. Notice also that Jupiter's edges are quite a bit dimmer than the rest of the disk. We always see this outer planet more or less fully lit, so the rim is where the sun is rising or setting on Jupiter. If Jupiter is still almost at its best, the situation won't last. Jupiter, known to some skywatchers affectionately as "Big Jupe" fades slightly this month and will continually become fainter and appear for a shorter time each night until next April. Then, Jupiter will slide back into the sun's glare. If you snap a stunning view of the moon and Jupiter this week and would like to share it with SPACE.com, send images and comments on the view to managing editor Tariq Malik at: tmalik@space.com.